Yup, Martin Walter put badges on the inside and outside of Dormobiles. I have gathered up a few photos to show you what I mean. First, on the left, is the Martin Walter sticker on the left rear of my Dormobile. As you can see, it is stuck on the paint above the backup lights, above the Land Rover station wagon plate. This particular sticker might be rare, I haven't seen it on any other Dormie. Inside the vehicle, Martin Walter put an ID plate with a serial number. 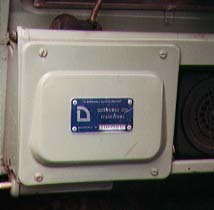 Land Rovers with dual wiper motors usually have their ID plate mounted on the bulkhead inside the passenger side cubby box area. land Rovers with a single wiper motor usually have their ID plate mounted on the wiper motor cover plate. The one on the right is from my right hand drive Dormie. I saw this badge on Paul Griffin's 1969 Land Rover Dormie in Wales. This is the newest badge I have seen so far. This is the early style Dormobile nameplate. This type was on Nick Beggarly's 1962 Dormobile and have been see on other early and mid 1960's Dormobiles. This later type nameplate came on my 1968 Dormobile. Copyright Dixon Kenner, 1995-2007. Last modified October 27, 2005.